There are thousands of stories of people overcoming adversity through running. These stories are the main reason that thousands more people get involved in running in the first place. 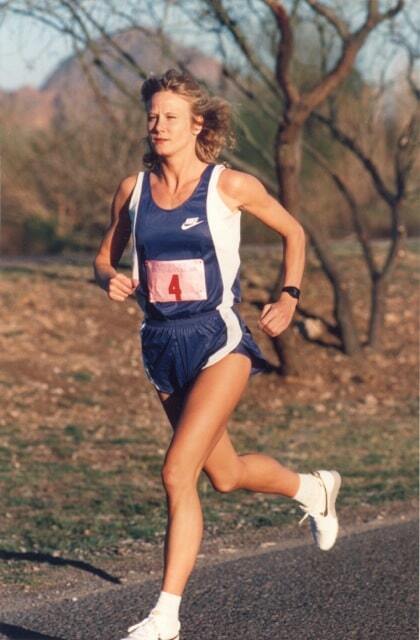 Former world-ranked marathoner Kim Jones’ story is one that could inspire anyone. Growing up in a poor household in a family seemingly prone to tragedy, Kim first used her running as an escape and later turned it into one of the most prolific elite careers ever. Known for starting many races well behind the leaders, Kim used the amazing sense of effort and pace learned from her asthma, of all things, to not only catch up to, but pass and defeat those early leaders. , a wonderfully detailed account of Kim’s childhood and running career and the many struggles that shaped her. We’d like to thank Kim for her time and with her the best of luck in her coaching and life. If any of Kim’s comments or thoughts speak to you, we’d love to hear about it. We also love to hear what you all think about our podcasts. You can leave a comment on this page or on our iTunes page. You can also leave us a voice message at (617) 356-7969. We look forward to your feedback and thanks for listening. I am really enjoying the new RC pod casts. The information is great and it is fun to hear from experts in the running field. One improvement suggestion though might be to find a way to enhance the volume of the interviewee’s. When I listen to these on my iPhone I can hear Lucas’ voice loud and clear but many of the interviewees are difficult to hear even with the volume turned all the way up. Thanks for the suggestion. We will definitely work on that! I really enjoyed hearing from Kim Jones in your podcast! It was not only very informative, but also fun to hear about her life & running career. Her autobiography, Dandelion Growing Wild, is definitely a must-read for everyone.